Had a great session in Grand Haven last Tuesday night. I was checking the weatheroff and on all day and getting a little crazy because it was already noon and there was no sign of any wind. Jetty got out of work early due to power outages and was at the beach when the wind first started cranking at around 2:00. He set up his 8 meter switchblade and was the first one on the water. 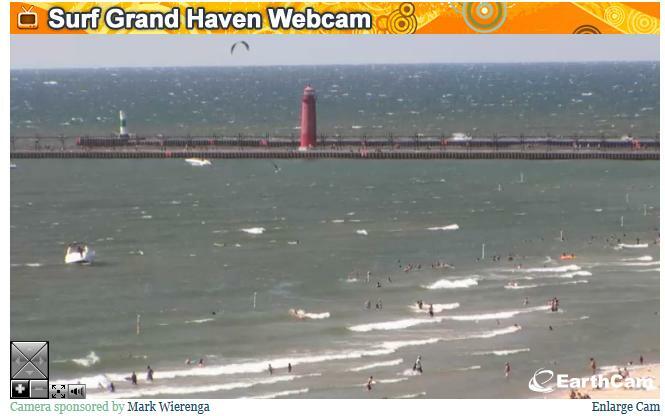 I decided to check out the conditions on surfgrandhaven.com and happened to catch Jetty jumping by the pier. Jetty catching some air by the pier. I closed my web browser immediately because I knew I had a few hours of work left before I could get out on the water. I arrived at about 5:15 and Jetty had already set up his 12 Convert for me so I was on the water within minutes. Wind speed was probably blowing 20-25 knots and was a little gusty but still very nice. Started out riding around some 4-5 foot choppy swells at city beach and then rode upwind to the pier. The lighthouse was creating a pretty good wind shadow and was creating some lulls. Afterward we headed back down the beach and played around in some rolling 3-4 footers. It was fun working on transitioning over the lip of the wave. The wind started dying off around 7:30 so we packed in and capped off another great summer session in Grand Haven. Next Post Forest Festival Throwdown!